Hubert Cartahu, a French artist member of La Maison des Artistes since 1987 , was born on the 26th June 1960 at St. Brieuc in Brittany. It was in 1975 that he met the professional sculptor Claude Delhhief who became his maître, providing inspiration and advice. After studying at the Beaux Arts in 1977, Cartahu started his career as a surrealist painter while at the same time doing portraits, which he still continues to do. After several years in his studio on the Cote d’Azur, his return to Brittany in 1986 gave birth to many other themes. Living by the sea he inevitably became interested in Maritime subjects. He changed his palette to suit the colours of the sea. 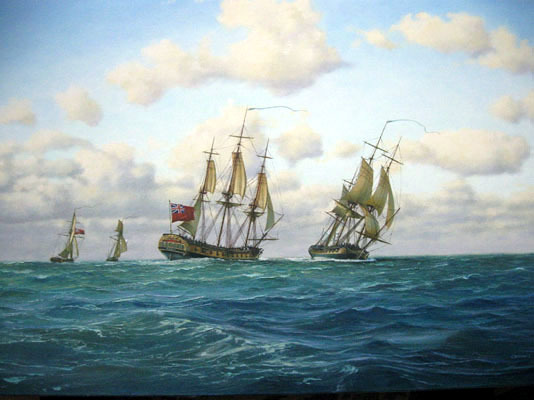 Each of his paintings either tell a story of a maritime event or sentiment. His highly detailed paintings take us back to the époque of elegant Sail Boats, Corsairs and Trans-Atlantic liners. The paintings are vibrant and meticulous in their detail. Cartahu can work to commission. Please email Julian Thomas for details.